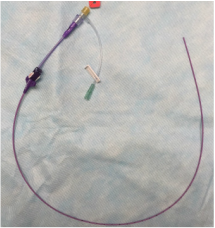 PICC (Peripherally Inserted Central Catheter). A PICC line can be used for extended IV antibiotic therapy, chemotherapy, difficult venous access, Multiple IV infusions/lab draws or total parenteral nutrition (TPN). The line can be used for a prolonged period of time. What is a PICC line and Why do I need it?